In the hard times, I have begun to speak words of hope to myself, especially when i want to wallow in my situation. Life can be hard, can’t it? And we can easily become swamped down by the what ifs, why mes, will it ever ends and Argggghhhhs. I especially love the Psalms, because I can see myself in most of them. Crying out to God in the midst of my anguish and pain. But that’s only part of the purpose for the Psalms, Beloved. The psalms were not penned to remind us we are alike in our difficulties in life, but to remind us of the Hope each psalm contains for us all. Hope Himself will rise to meet us, as God met each psalmist in their journey of waiting and seeking. Our living Hope is entrenched in each word of HiStory, the Bible; for He is both the inspiration for every word and the rescue for each person recorded in its history. And because He is, and always will be, He is our Living Hope in our present moments, no matter what they are. He rejoices with us when we get or hear good news. He cries with us when our hearts break from sudden or slow loss. He mourns with us in our grief. He actively pursues us when we feel lonely. He houses us when the echoes of abandonment try to return. He makes His home with us, giving us hope, purpose and a future intertwined with his heart. 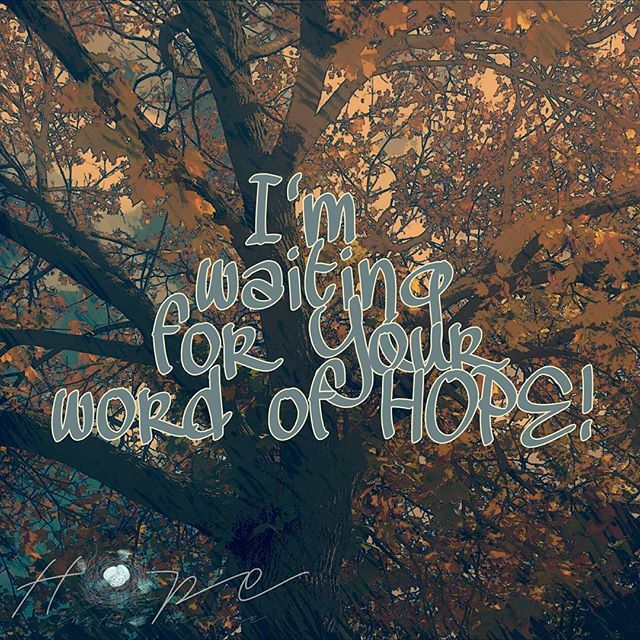 So like the psalmist of Psalm 119, I choose to wait for His word of Hope. For Him to speak life into my weary brittle bones. To spark passion into the embers of my dry heart. To come to me and show Himself strong. To love up on me in every area where I have lack. To provide over and above what I can believe for in the natural. Because You have never failed to reveal Yourself to expectant hearts who eagerly wait for You. Will you join me in the wait?